Hiya guys. I am so terribly exhausted due to my lovely snoring husband and my little kicking puppy. I really don't know which one of them I was angrier at, but neither one of them will be sleeping with me tonight! Yeah I'll probably give into the puppy dog eyes tonight, but for now I can at least pretend I'll stick to my words haha. Anyway, for today I thought I'd show you guys some quick and easy Easter designs. I really struggled to come up with Easter nail designs this year. In all honesty the holiday felt like it snuck up on me out of no where. If I have time I'd like to recreate my two main designs from last year that were really popular. But I'll probably end up just doing a repost if I don't have time. I'm not entirely happy with the outcome for this one at all. The carrots were supposed to be a lot smaller, but my good detail brush got a first encounter with my puppy Sophia and did not survive. I definitely recommend aiming for smaller scale carrots if you attempt to recreate the design. When I was in the editing process of my photos I noticed I forgot one key element to these bunnies... their whiskers! Ugh, I'm so ashamed! But it's still not terrible, again I wish I had a thinner brush to work with. I attempted to record a video of this, but it was a nightmare angle to work with. I must practice recording! Which one of the manis is your favorite? Don't forget the other ladies participating in my group The Nail Crazies Challenge on Facebook! Your nails are so cute. I tried to do an easter egg on my accent nails, but it looks like a blind person did them. Sigh. These are all so cute. I love the bunnies and the carrots. I need to do something with my nails. I'm sorry about your sleep. I have a snorer and it drives me nuts! I do a lot of pushing and shoving at night. Anyway, I love these nails. They are suuuuper cute especially the carrots. Those are so adorable! I especially love the little bunnies. Wonderful! Super cute! Bad puppy Sophia for eating your nail brush! Oh my word! Now is when I wish I had longer nails to do this type of thing to! How cute. I love the bunnies! They both look great, but I especially love the bunnies and dots! Really cute! These are super cute and just in time for Easter. 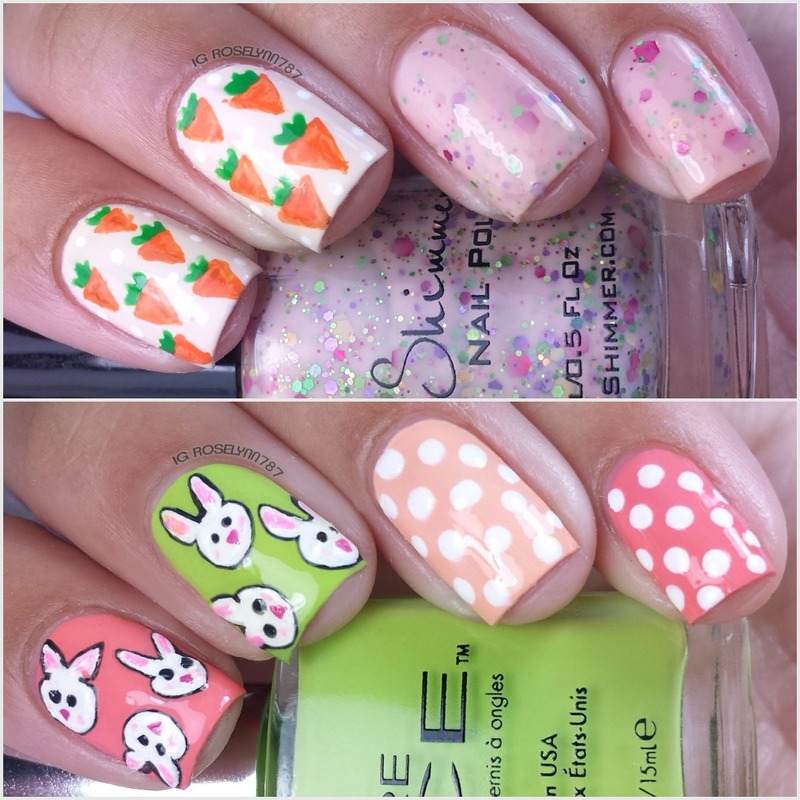 I cannot decide if I like the carrots or the bunnies better! I think the carrots! Both really cute! I love the carrots best. Those are some fun designs. You are not alone with a snoring husband. Luckily our dogs does not sleep with us or else, I will become a vampire lol. 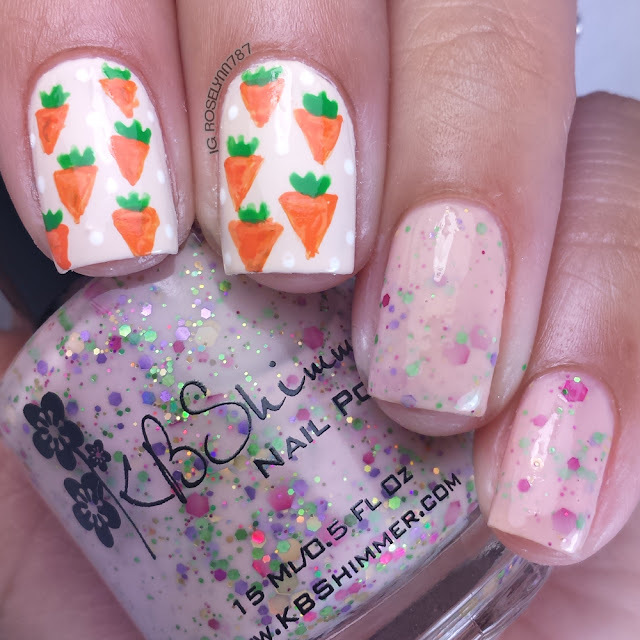 The one with the littler carrots on it are so cute! Those bunny nails are gonna be the death of me! They are so freaking cute!!! These are all so cute! I'm not sure which one is my favorite! My daughter would love the creative designs. Very cute. Our daughter has just started painting her nails, I'm pretty sure the really fun stuff like this is not far behind. Have you tried a tripod for recording video? Many cameras have a mount for them now and they aren't all that expensive. Just a thought. The nail designs with the carrots and the bunnies are super favorites. They're both so cute and photo-worthy, that's for sure. I think the bunnies look cute enough without whiskers. Both designs are adorable though. 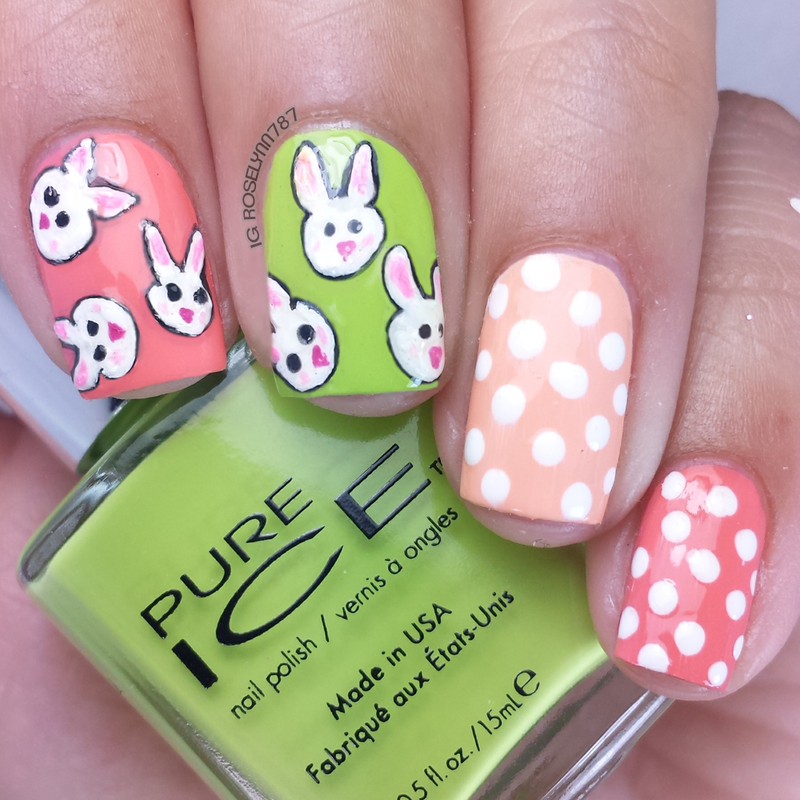 This nail art is perfect for easter! 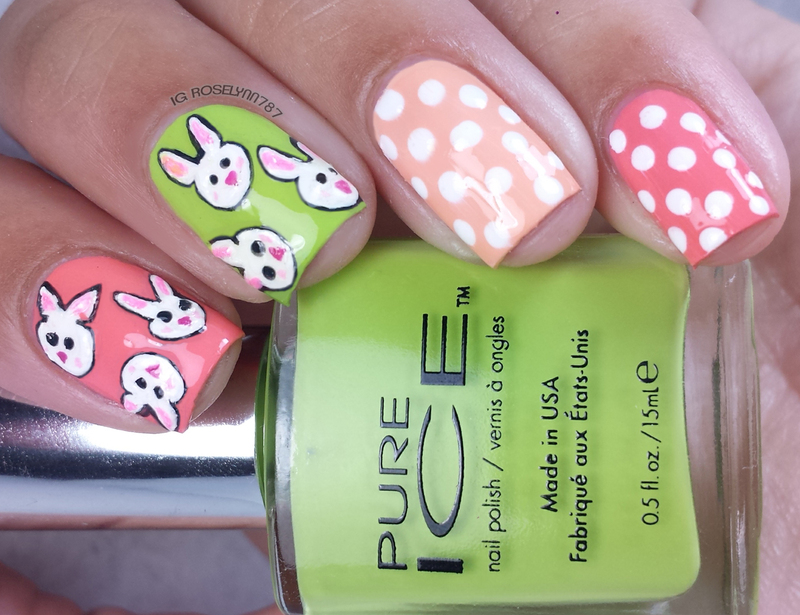 These are fantastic Easter nails. 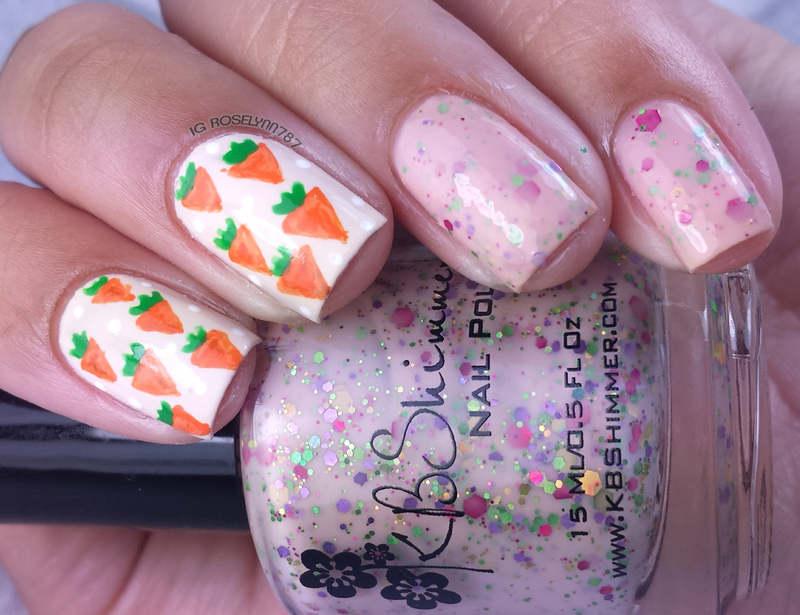 I love how cute the carrots are. I will have to try this on my nails. These are both so cute!! The bunnies are adorable! Oh wow! You actually drew the designs on your nails? You are super talented. I can barely put a coat of polish on my nails without it looking like a mess. These are both so adorable! These are both super fun, great freehand work! Both are adorable, but I think the second mani is my absolute favorite! I think both are cute but I am definitely partial to animal nail art! The bunnies are adorable! Those bunnies are so cute! Your nails are so super cute! I love how creative you got with them! I love these nail designs. The Bunnies are adorable. I will have to do some spring nails for this week. Oh my gosh These are too cute. I have never tried doing an Easter design before. Beautiful nail art! I wish I could even paint anything that tiny without my hand going all over the place, they look so cute! I have several bottles of ICE nail polish. I especially like your polka dot nail art. My kids, however, would love your rabbits. I know I'm late, but you are seriously talented! These designs are adorable!